This Here on Earth program deals with the topic of child soldiers. Ann Strainchamp’s guests are Uzodinma Iweala, a 24-year-old Harvard graduate who wrote a novel about child soldiers, and Joe Bakker, children’s right advocacy director for Human Rights Watch, an independent organization that conducts investigations concerning human right’s abuses. In the beginning of the radio show Uzodinma Iweala explains why he decided to write his book. 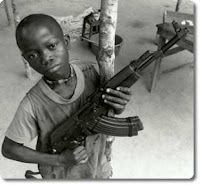 Aged 16 he came home from school one day and read an article about child soldiers in Sierra Leone in Newsweek magazine. He was really disturbed after reading it because he realised that these children were about his age and that all this happened in an area he knew very well since his parents came from there. The young boy cared about the topic too much to just dismiss it, so he did some research, talked to many former child soldiers and the result of all this is a book that got a lot of praise by the media. Writing the book was very important for him because he felt that a novel telling a specific, personal story will open more eyes and touch more people than all the statistics. Nobody knows how many child soldiers are really out there fighting in armed conflicts all over the world but it is estimated that there are about 300 000, between the ages eight and sixteen. These children are coerced into being soldiers either because they are forced by the people who abduct them or by situations like hunger, lack of education or lack of work. Once they are with the troop they will be fighting with they are made addicted, for two reasons. Firstly when they are addicted to drugs or alcohol they can’t run away any longer because they need the substance they are addicted to and can only get it if they stay with their troop. And secondly they kill more readily when they are under the influence of a specific substance. One very cruel method is treating the children with gun powder, either they force them to eat it or press it into open wounds to make it enter their bloodstream more quickly. With this method, they make their soldiers more aggressive and less fearful. Unfortunately it is very easy for the commanders to make their future soldiers amenable. Another fact they take advantage of is that children aged eight or nine can easily be influenced. This is the age at which children form their values and if they’re told often enough that killing is right, they will believe it and never think of the consequences of their actions. Not all of the little soldiers really have to fight, some of them die before they get the “chance” to do so. Very often they are used as shields, human mine detectors or suicide bombers because children attract less attention. Fortunately some of those kids who got deprived of their innocence and childhood manage to flee or are rescued. But even then, they are confronted with a lot of problems. Many former child soldiers who are rescued don’t get any help because people think that they are lost and that humanity left them. Of course, this is true with some of them, but this is a very small percentage. The mental state they are in depends on how strong they are and on how much evil they have seen and committed. Still, those children need to get help and need to get a lot of support. They have to be given the chance to participate in rehabilitation programs in order to make it possible for them to be reintegrated into society. Many communities in Africa offer reconciliation ceremonies, others expect their returned children to do community service, help the families of their victims etc. Many children feel a lot of guilt and have nightmares, and if they feel like that, it is especially important for them to feel acceptance. Of course they killed people and caused a lot of harm, but they were victims themselves: They didn’t have any choice, either they killed or they were killed. Most people in the industrialized world seem to feel a subtle indifference to what is happening in Africa. From time to time, we read about child soldiers in the newspapers. But this heartbreaking method of fighting wars only seldom appears on the news because journalists look for the news of the day. The sad truth is that sending children into wars happens every day, and not only in Africa. Yesterday, I read an interesting article in the Kleine Zeitung, written by Alexander Widner for his column "Letters from New York". In the article, he talks about his experiences with American Russians. First of all, Widner describes the residential neighbourhood Sheepshead Bay in southern Brooklyn where the common language is Russian instead of English and the cyrillic alphabet is as common as the latin one. If somebody asks you a question in Russian and you don't understand it people will be astonished. Ne paruski? That's what you're asked if you don't know Russian there. Sheepshead Bay is a Russian settlement area. The last spate of immigrants arrived in the 90's, predominantly Russian Jews and many many old people. They are no longer dreaming of starting a new life, they don't think about the American Dream. Welfare check, free housing, food from the Kosher Food Network of the Metropolitan Council on Jewish Poverty. No life in luxury but still they emmigrated? Why? "It's no life in affluence but it's secure. And it hasn't always been. I wanted, at least once in my life, live unmolested, without all this anti-Semitic crap that is still alive in Russia." That's what a 70 year old woman said, in very broken English. She lives in the ghetto and can't leave it. Not because she's forced to stay but because she couldn't communicate and cope with the life outside Little Odessa. A young man joins the conversation of Alexander Widner and the old lady. He says that he had actually planned to stay in Vienna but got abused because of his skullcap after three days. That's when he realised that he had to continue his journey. He says that there's no big distance between being abused and being beaten up and so he went to the USA. His family stayed in Vienna. They now have a big house, a lot of money and an enterprise that works out really well. But that's not what he wanted. He only wanted to live as a Jew, in peace. He now can live his life in peace with a wife, two children and a job. It is very important to him that English is the first language for his children and Russian only the second one because he wants to make a life outside Little Odessa possible for them. By the way: Just arround the corner there are two adjacent buildings: A mosque and a Jewish school. "No, there have never been incidents due to the coexistence. Why should there be?" says Esther, a teacher at the Jewish school. Yes... Why should there be? Today, I read an interesting Newsweek article that I will briefly summarize. After that, I will write what I think about homeschooling. In the United States, more and more parents prefer to educate their teenagers at home. In 2001, more than a million students in the USA were being home schooled, which means that there has been an increase of 29% in two years. But it is not only the parents who are increasingly attracted by it, there are also many teenagers who don’t like going to school but don’t want to drop out either and who therefore suggest home schooling to their parents. Opinions on the topic vary since just like with everything there are advantages and disadvantages. Critics argue that an important part of teenager’s social life takes place in the school they attend and that they learn for life there. In school, they have to learn how to cope with many different people and they learn a lot concerning social interaction. In their opinion, homeschooled children can easily bet isolated and have a hard time making friends. Another point of critique for opponents is that teenagers, when being homeschooled, miss out on formative events like the prom or graduation. Supporters argue that being homeschooled makes the life of teenagers a lot easier. At home, they are save from the violence in schools that is constantly increasing, and peer pressure can be avoided more easily as well. They also have a clear refutation to the isolation argument: Isolation is not a question of homeschooling but a question of parenting. Advocates argue that the majority of parents do get out with their kids and do a lot with them. Prom and graduation is also no valuable argument in their eyes. They don’t miss out on that because homeschooling groups organise such events as well by inviting the whole community, awarding diplomas and holding speeches. In my opinion, homeschooling really is not a good thing to do. I strongly think that the teenagers miss out on a lot of experiences that they would have if they were in a normal high school. Of course, school is annoying for every student, but the social component definitely has to be considered. In high school, I met many of my present-day best friends and I often think back to the time there. All those school trips are really something I wouldn’t like to miss, and although I complained a lot about school, I loved going there. On graduation day, I was really sad that school was over! Another point I am a bit worried about is the standard of education. Of course, the different states have regulations concerning homeschooling, but who is able to control what the children are actually being taught? Evolutionist parents will never tell their children about Darwin, and so the children won’t have the chance to make their own opinion on the topic. And that’s what I consider very problematic. Parents only teach what they want their children to know, and thereby they could be deprived of a lot of knowledge. On the other hand, I think that homeschooling is a good opportunity for children or teenagers that are bullied in school and just can’t stand that any longer. Still I think that homeschooling shouldn’t be chosen as an easy way out because homeschooled children will lack a lot of experience and beautiful memories later on. It was really hard to find a useful blog from somebody who left for Bosnia, Serbia or Croatia. The few that I could find were not really informative, but after all I found one. It is a closed blog because the writer went back to the US again, but still I liked it. Well, the blog was written by Brooke, a woman who accompanied her husband (who is not Serbian but American too) to Belgrad, Serbia because he was offered a job there. When she moved there, she had no idea about what to expect. She and her friends didn't even know that there was a place called Serbia, all they knew was that there was the Bosnian War, because that was all she read and heard in the news. She experienced two great years in Serbia and there's a lot she loves about the country. Reading the blog gives you a very good understanding of the Serbian culture, and you can also learn a lot about the US because she does a lot of comparisons. Still she never says America is better, or Serbia is better, she loves both countries and in each country there are things that she's worried about. There are many anti-Bush posts which shows that she is very worried about her homecountry. She encourages people to vote and puts bumper stickers saying "Blind faith in bad leadership is not patriotism" or "Pro America, Anti Bush" online. n her eyes, people in Serbia are generally friendly but she says that basically people are the same everywhere. There are assholes and there are kind and helpful people, and you'll meet members of each breed everywhere. What especially liked are her descriptions of the problems she had with the language since I have to struggle with the strange grammar of BKS every day. 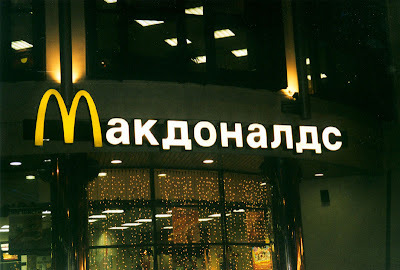 And there are many posts describing her problems with the cyrillic alphabet. She was not able to read a street sign nor could she read what groceries she actually bought. What I liked about the blog is that her posts really vary a lot. Some of them are really funny while others are very philosophic. Sometimes she praises Serbia, sometimes she is really annoyed. Actually, there is so much information in the blog that I can't tell you about it all. But if you're interested in the culture of Serbia or in the language, I can only recommend the blog. In my eyes, what makes a book a goog book is that it makes you feel as if you were there. And this really was the case. When Frances Mayes described how she walked through the house and loved every room and just enjoyed it I could imagine what this must be like. And when she wrote about Italian piazzas and restaurants, I felt the strong desire to have a coffee and to eat something (very very bad, maybe I should blame Francis Mayles for what the mean little boy did to me). On the other hand, I have to admit that sometimes she exaggerated her descpritions. The way she describes Italian life and Italian mentality is great, but there are so many descriptions of ways she likes to walk along with exact details about the churches and trees and stones and dust particles are too much... Or at least, that's too much for ME. And if I liked cooking I would also try some of her receipes... But I'll try to find someone to cook for me since all that really sounded like I HAVE to eat it. Well, that's it I guess... My brain needs some rest, who knows what will happen next if it doesn't get the ease it needs? Finally, here it is: My interview with Thomas who left the UK for Germany. When did you go to Germany, and why? I came to Germany in September 2000, having been offered work by a company after graduating university. What do you like about living in Germany, and what was easier or better in your home country? The central location in Europe makes travelling easy, for work (e.g. Turin = 1 hr flight) and private (London = 1 hr flight, Alicante = 2 hr flight, snowboarding in France = 7 hours drive), weather – in this region – is relatively mild, the city where I live is clean and respectable, I don’t feel insecure when I am out or travelling, and some of the autobahns have no speed limit!!! If you had to compare Germany and Great Britain: What would you say is similar in both countries and what is different? Both countries have strong markets, but in the UK I feel I have more shopping choice and better customer service – especially face to face… People in both countries are generally respectful and responsible, but I find in Germany some people take this too the extreme of almost believing they are police officers… Both countries have a fairly welcoming approach to foreigners, though making friends seems to take a long time here in German. I find the UK has a quicker updating and more extensive choice of entertainment – food, music, film, festival etc. Germany has maybe a greater number of local and traditional festivals which provide a look into local culture and history……….both countries have product culture and strong brand awareness, but only in Germany can you can buy a fast car and drive it (legally) fast too !! ……. Bank branches open on Saturdays and most shops on Sundays in the UK. There is also a big difference between single life (like mine) and say becoming part of the bigger system by having a family here which means even more to learn and do – single life is generally easier anywhere. What about learning the local language? Do you think it is important to learn it, and do you need it in your workplace? HOW did you learn German? I already speak English and Spanish and have an interest in languages so for me it’s important to make an effort to learn a local language. Personally I do not need so much at the workplace as I work for a Japanese company…but I have some German work colleagues…….My first German words I learnt from my first girlfriend here (she was a little lazy in using her English to help me understand, so I had to try and make the effort to understand more of her), the rest has built up over almost 7 years from reading and listening and copying and trying and pestering colleagues!! But being bilingual from the start makes a big difference to the ease of learning another language, if anything because you realise quicker the links that exist between European languages. If you had to choose again: Would you go to Germany again? Are you homesick sometimes? Do you miss anything particular? Yes I can get a little homesick– I get frustrated not understanding the people or the language here at times, I have some good friends I miss, I miss the wider choice of events, and the shopping in general (especially opening hours), and many things are simply easier to understand because I know it from my own background or I have family or contacts I can ask or who can help me directly. And finally: What advice would you give other expats that are planning to move to Germany? Again, the weekend wasn't too relaxing... I had to prepare my presentation, translate a text for my second language and did a lot of research for my superinteresting, thrilling essay about George B. Shaw. I also did a little research on why so many people like jogging. Eleven o'clock, I'm walking around sleepily, whom do I meet? My uncle, jogging. Two o'clock, I'm awake, whom do I meet? My cousin, jogging. So I started wondering whether I'm a bit strange, went home, got my beautiful, new, pink running shoes and got started. Everything was ok and I started to think about liking jogging. But then it started to rain. I was in the middle of the wood, no chance to escape, so I more or less sprinted home. This had the effect that my knee hurt, I was completely wet and my new shoes were no longer pink... Will I go jogging again? Probably not. Or maybe I will if I have another traumatic experience like the one I had last friday. I'm sitting on a bench, thinking of nothing bad, watching a soccer game with my brother. A little boy, maximum 6 years old, comes over and asks my brother whether the girl next to him was his sister. My brother said yes, and the little pest replied "Well, my sister is more beautiful than yours is because my sister isn't FAT."